Recently I have had a few questions about ways to create animations with assembly motion. These questions brought to mind this great tip on using Mates to generate assembly motion. Using Mates to create motion in Assemblies is often overlooked so I have prepared this video that includes a simple example of how to do it. Click on the image below to view the video. 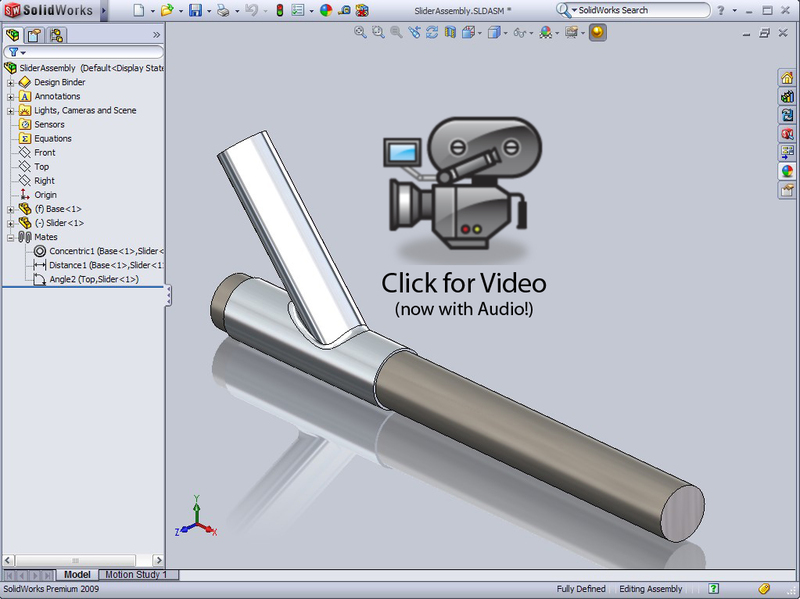 3D PDF coming to SolidWorks! That's really cool, Ricky. You make it look so easy to do. Great tip Ricky. Always looking for a “simple” way of showing an annimation. Thanks Steve! It is pretty easy to do. It is almost always the first option I look at when creating motion studies where parts need to move in a precise manner. That is a handy resource. Thanks Ricky. Good to hear from ya! Yeah, it doesn’t get any more simple than this when it comes to Motion Studies. Glad you like it! You just saved my life for something I was trying to do with animations. Just did not know how to go about it properly and you showed me how to do that twisting motion easily. Guess that is the difference between a pro and a wanna be. thanks Ricky. No problem! Glad you liked it Gary! I'm definitely not a pro with Motion Studies, but thanks for the complement. I'm glad the information in the tip was helpful. Hi Ricky, thanks for this video, it has helped me allot. I see you are getting great shadows and mirrorwing effects, is this due to your video card? Oh Man Why I didnt find you earlier. this is way too easy.. I think LOL thanks for the tip. That's a nice video tutorial. I have a linier rack assembly that has two extentions inside the main assembly and I need help with making the inside arms sub-assemblies extend out from the main assembly. How do I control each assembly to extend out from the main assembly?